Our product range includes a wide range of semi-automatic bottle filling machine, automatic bottle filling & capping machine, rinsing filling & capping machine, automatic 40 bpm bottle rfc machine, automatic 60 bpm bottle rfc machine and automatic 90 bpm bottle rfc machine. Aiming our Client's gratification, the offered Semi Automatic Bottle Filling Machines are manufactured in compliance with the set industry guidelines and standards. The utilization of high-grade raw materials and modern machines, empowers our this variety of Bottle Filling Machines with superior sturdiness, performance, and functional life. 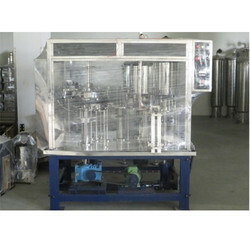 These machines are used for manually filling the bottles for packaged drinking water, oil, syrups, and loose paste products. Bottle Capacity 200 ml to 2 Liter. 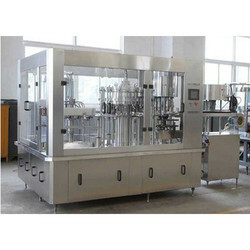 We are betrothed in manufacturing and supplying Automatic Bottle Rinsing Filling and Capping Machine that proffers quick and excellent performance in the capping of bottles. 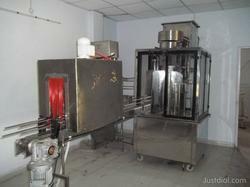 This machine is accurately manufactured under the guidance of our experts in compliance with industry norms. To prove high quality this machine, various tests are carried out on adverse conditions by our quality controllers. Furthermore, this is made available in varied technical specifications at affordable prices. 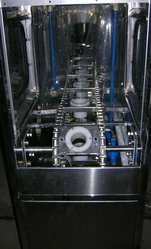 Neelkanth Packaging Machinery is known in the market for liquid filling and packaging machines for industries like Food & Beverages, Oil, Agrochemicals. 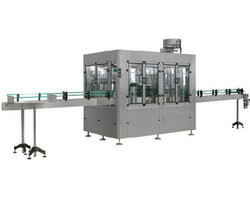 We manufacture Automatic Rinsing Filling Capping Machine, Semi-Automatic filling machine, Air Conveyor, Discharge Conveyor, Auto Sleeve Labeling Machine, Automatic BOPP Labeling, Automatic Web Sealer, etc. 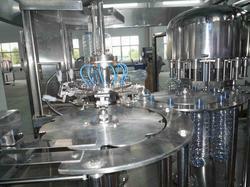 RFC Machine Series is based on the fully automatic process like Bottle Rinsing, Filling, Capping Machine etc. This machine equipped with man-machine technology with all automation. 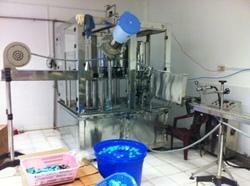 Mainly used for washing, filling, and capping, etc. Air Blow Conveyor on the in the feed. Slat Belt Conveyor on the outfeed with Inspection Table. No Bottle - No Rinse - No Fill - No Cap. Unique Pick & Place type Capping with adjustable torque mechanism. Speed Control by AC Drive. Cap Elevator for feeding cap to the chute with automatic operation. 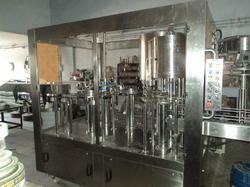 Stainless Steel enclosure provided for complete hygienic bottling. Easy open nozzles for easy cleaning. Can be linked directly to Automatic Blow Molding Machine for online Blow- Rinse-Fill-Seal. Compatible with Online Shrink Tunnel, Labeling Machine or Ink Jet Printer. We are one of the leading manufacturers and suppliers of Automatic RFC Machine 40 BPM. The offered automatic rinsing filling and capping machine is a special fabrication for the automatic cleaning, filling and capping of the water jars and bottles. 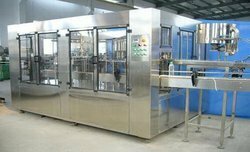 Our manufactured automatic rinsing filling and capping machine is easily available at a very affordable and reasonably economic market selling price. We are Manufactured in accordance with the established quality norms & standards, the range is extensively demanded in diverse industrial applications for the qualitative packaging of mineral water bottles. 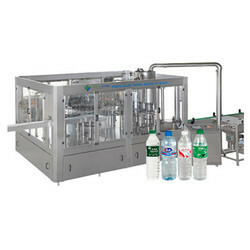 In this range, 60 BPM Bottle Filling Machine, Mineral Water Packing Machine, Mineral Water Bottle Packing Machine and Mineral Water Bottle Packing Machinery are few to name. Offered in varied specifications & configurations, the range is widely appreciated for rugged construction, low maintenance, and excellent performance. 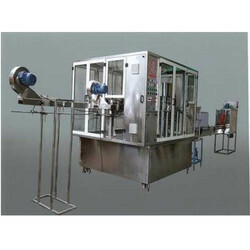 Fully Automatic 90 BPM RFC Machine (Rinsing, Filling, Capping Machine) is a fully automatic multifunctional combined machine integrating washing, filling and capping into a single body. This machine is equipped with advanced man-machine interfacial control technology with all necessary automation. It works on hanging neck holding method. Hence, a very convenient bottle changeover. 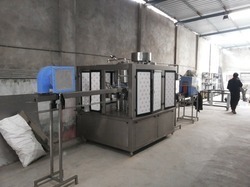 Versatile machine to pack mineral water as well as other beverages like fruit juice, squash etc. Bottle Capacity: 200 ml to 2 Liter. Air Blow Conveyor on the in feed. Slat Belt Conveyor on the out feed with Inspection Table.